Cuivre River State Park is a state-owned, public recreation area located northeast of the city of Troy Missouri. The state park’s rugged landscapes range from native grasslands and savannas to limestone bluffs overlooking forested hills. The park encompasses the Lincoln Hills Natural Area (1872 acres) and two designated wild areas: Big Sugar Creek (1675 acres) and Northwoods (1082 acres). The park offers an extensive system of hiking trails plus swimming and camping facilities and is managed by the Missouri Department of Natural Resources. The park began as a federal recreation demonstration area in the 1930s when workers from the Civilian Conservation Corps and the Works Project Administration constructed roads, bridges, group camps, and a picnic shelter. Two historic districts within the park, the Cuiver River State Park Administrative Area and Camp Sherwood Forest, were added to the National Register of Historic Places in 1985. The state took possession of the park in 1946. Welcome! 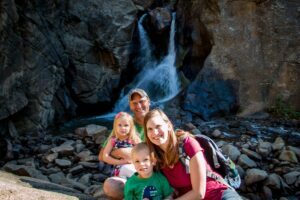 We are a family looking for fun and budget friendly adventures in the Midwest and beyond. We decided to share all the hiking trails, interesting sites, and other must see places we have found on our travels. Enter your email address to subscribe to this blog and receive notifications of new posts by email. We will never sell or Spam your email box.